Monday, January 23, 1911. Here’s Monday, another school day. It’s so hard to get up awful early, when you feel nice and sleepy. Sometimes I wish that Grandma provided more detail when she wrote. For example, I wonder what Grandma ate for breakfast. I imagine that it was similar to what I ate two generations later when I was growing up on another farm near McEwensville—but I might be totally wrong. In January we generally ate pancakes (griddle cakes) for breakfast. We often ate pancakes made from a mix, but occasionally had the more traditional buckwheat griddle cakes that I envision would have been eaten when Grandma was young. After the pancakes were cooked I’d put maple syrup or jam on mine—but my father always put old-fashioned liverwurst on his. We only had pancakes when liverwurst was available, and that was only during the winter months when my family or a neighbor butchered a hog. One find was a promotional cookbook published by KC Baking Powder in 1911 that contains a recipe for Buckwheat Griddle Cakes. I decided to make the recipe to see if they were like the buckwheat cakes I remembered. Sift together, three times, the flour, sugar, salt, and baking powder*; stir the water in all at once and bake immediately on a hot well-oiled griddle. Buckwheat flour calls for a generous measure of baking powder. Part milk may be used to mix the cakes but water give quite as good results. *I just stirred the ingredients together and didn’t sift anything. I’m not sure why old-time cookbook authors were obsessed with sifting. I was surprised how few ingredients there were, but from looking through the cookbook I realized that most recipes a hundred years ago had very few ingredients. I guess that since people cooked from scratch every day that they gravitated toward simple recipes. After I’d cooked the griddle cakes—I poured some maple syrup on them and took a bite. They were very good though the robust taste of the buckwheat was a prominent undertone. I then remembered that I had a jar of homemade current conserve that a friend of my daughter’s had given me. (An aside–I think that it’s really cool how some young people care enough about what they eat to revive traditional cooking and food preservation). I spooned a little conserve on the griddle cakes and took a bite—and the taste was awesome. The tartness of the conserve wonderfully complemented the robustness of the griddle cakes—and I almost felt like I had drifted back to Grandma’s day. Posted on January 23, 2011 August 30, 2015 by SherylPosted in Food, recipesTagged bread, buckwheat, pancakes. Looks good. I’ll have to try making them sometime. Long time fan, first time reader. I will get the recipe to you for the conserve. I thought you might like to know that they were made by my 17 year old baby brother. He enjoys canning and cooking old recipes of my grandmother and her mother. I love this idea for your blog. I’ve wanted to do something for years with the old diaries we have, and this is really inspiring me to think of things to do with them! Some of them are quite detailed. Thanks for the nice note and for giving me the wonderful conserve–and tell your brother thanks for making it. Like him, I think it’s fun to make the old family recipes. You should do something with your family’s old diaries. I’ve really enjoyed pulling things together for this blog. In the past old family history artifacts so often gathered dust in closets and attics, but technology makes it so much easier to share them with relatives and friends. Pancakes are one of my favorite breakfasts. I like them with butter and maple syrup or with fruit and plain yougurt and maple syrup. I cannot imagine eating them with liverwurst! Even though I use the same recipe my mother used for some reason mine do not taste as good. Maybe I’m changing something. I wonder if the quality of the ingredients (or their components) might have changed somehow over the years. For example, I saw an article in the newspaper today about how the buttermilk that is sold in stores today is really different from the buttermilk that forms during the actual butter-making process. I did notice that today’s buttermilk is quite a bit thicker than what my grandfather used to drink. You are probably on to something. Here’s the link to the article that I saw in the New York Times about buttermilk. I also love buckwheat flour. It has such wonderful hearty taste; and I think that it is one of the most under-utilized flours in recipes. Sifting would have been to completely mix in the baking soda, believe me you did not want it to be not mixed well. Ah, also to aerate it I think. Regarding the buckwheat cakes. We, my mother and grandmother, did not use baking powder. We used Fleischmann’s fresh yeast. 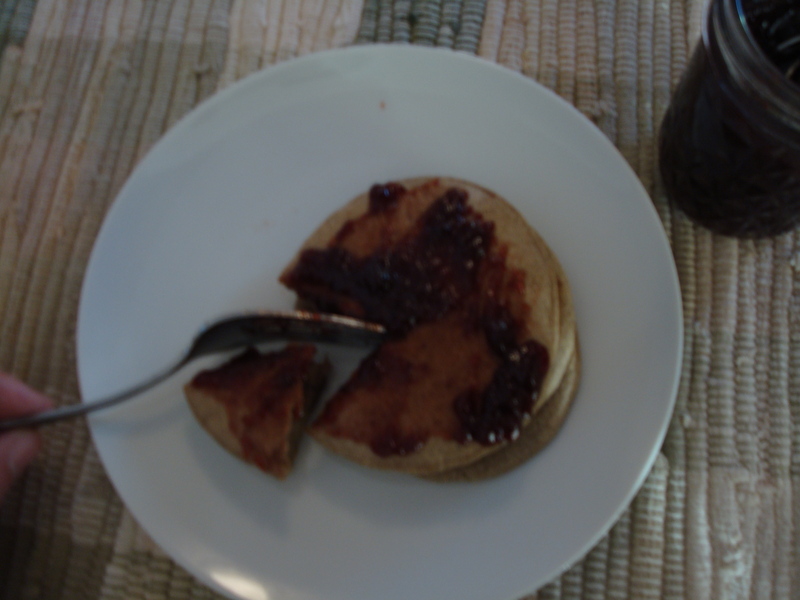 Today’s Active Dry Yeast was yet invented/discovered……..
Our buckwheat cakes toppings included: homemade puddin meat, homemade syrup made with water, white and/or /brown sugar with vanilla added for flavor, real natural honey, homemade grape jelly; homemade apple and elderberry jelly, and homemade apple butter. – NOW for our Big Polish Breakfast we also had homemade Kielbasa, dry cured and smoked with hickory and sassafras wood. 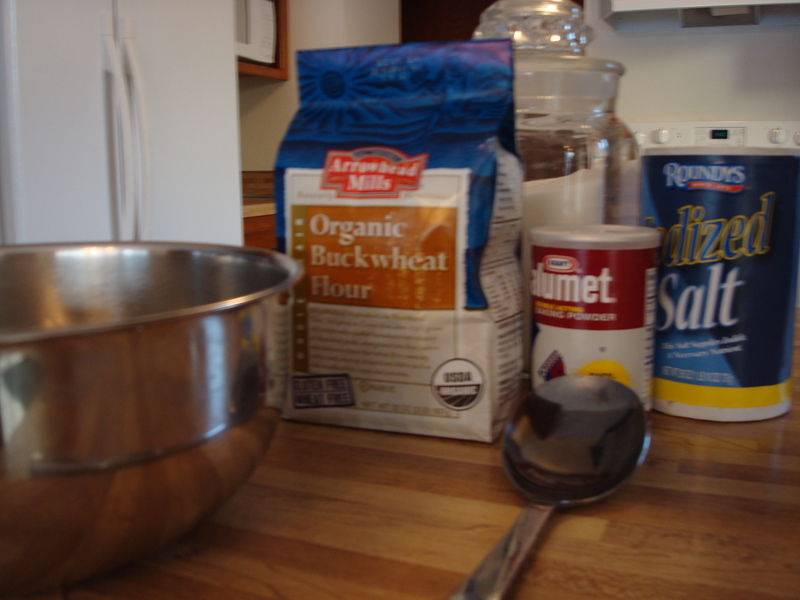 The use of yeast is the more traditional way of making buckwheat pancakes. Baking powder was a relatively new product in the early years of the 20th century. Your list of toppings reminds me of the toppings my family had when I was a child. I hadn’t thought about “puddin meat” in years- but now that you mention it, that is what my father called liverwurst. My family always made liverwurst when we butchered, but it was different from modern liverwurst recipes.